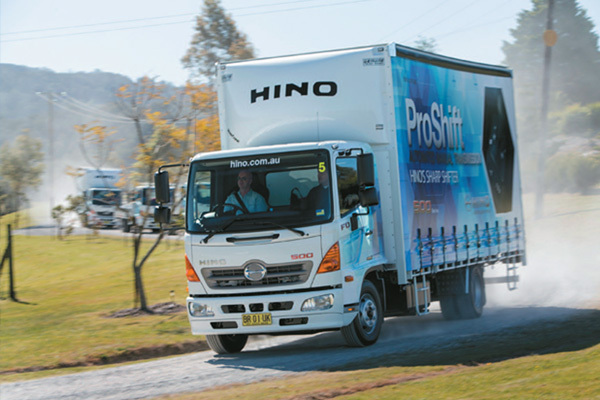 Hino has introduced its new ProShift 6 transmission, allowing Matt Wood to test the AMT-equipped 500 FC and FD variants on a two-day run south of Sydney. 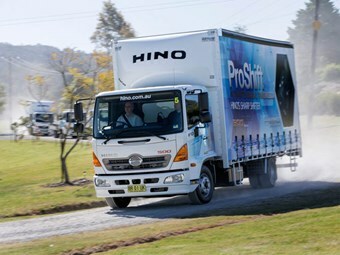 Hino has just introduced its new ProShift 6 automated manual transmission (AMT) in selected 500 series FC and FD models. I recently had a chance to drive the new automated cog swapper to see how the latest two-pedal AMT to come out of Japan performed, both on the open road and around town. The first Hino 500 series truck to be tested was the Hino FC 1022 4x2, powered by a JO7E-TP five cylinder ADR 80/03 OHC turbo diesel engine with EGR. It offers 240hp (176kW) of power and 716Nm of torque at 2,400rpm. The second test model was the Hino FD 1124 4x2, running a JO7E-TR turbo diesel engine that offers 220hp (162kW) of power and 647nM of torque at 2,400rpm. In keeping with the rest of the vehicles, the ProShift 6 gear stick is just as simple and hopefully durable. At the outset it seemed the stubby little transmission shift was quite intuitive in both placement and design. More to the point, it was pretty much the same sort of layout you’d find in any relatively recent passenger car — ‘D’ for drive, ‘N’ for neutral, across and through a gate to the left for reverse, and a gate to the right for the manual sequential shift mode. Just to keep me happy, Hino has installed some buttons to push. The first is a power mode button which tells the transmission to hold off on gear changes a bit longer, giving the engine another 500-600rpm to play with before attempting another gear change. The second button is labelled ‘slow’. I was hoping this was maybe a kind of explosive device for removing slow drivers from the right-hand lane of a freeway, but unfortunately it’s actually a low-speed manoeuvring button. When you engage the slow button, engine revs are limited to 550rpm with the clutch fully disengaged. This takes care of the ‘on or off’ uncertainty that can sometimes affect AMT boxes at low speed due to uncertain clutch engagement. With the slow button engaged, the truck should just idle along forwards or in reverse without any gritted teeth and bunny hopping on the driver’s part. 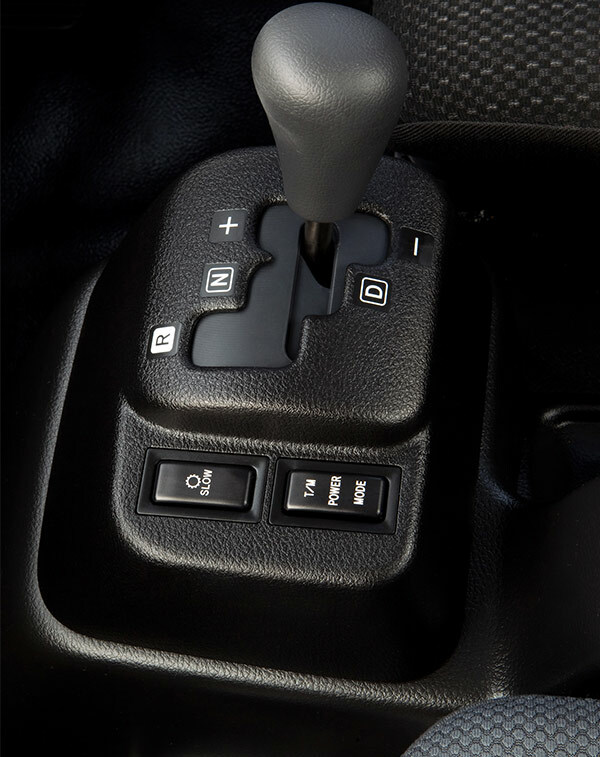 The gearbox itself is the same 6-speed LX transmission that Hino has been using across the range in manual guise. However, like any other AMT on the market, the cogs are swapped by a servo shift that is told what to do by an electrical control unit (ECU) which in turn is told what to do by the engine ECU. But where the ProShift differs is with a standard dry plate clutch as used in the manual version, rather than a viscous fluid coupling that other AMTs on the market use. This is hydraulically actuated and is controlled by the gearbox ECU. Hino claims a gain in driveline performance and efficiency as a direct result of using a direct mechanical method of driveline engagement. 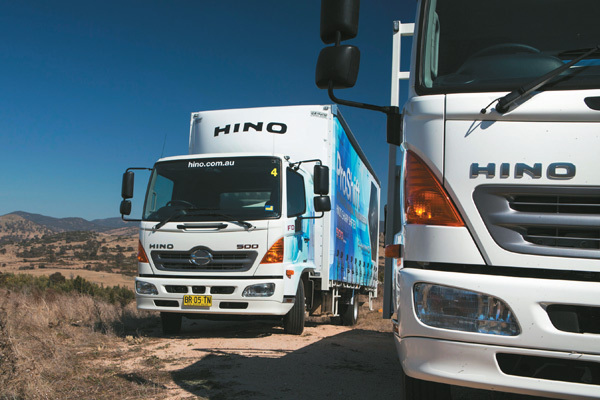 Hino also claims a possible 10-15 per cent advantage in fuel economy over rival AMTs and torque-converter transmissions. 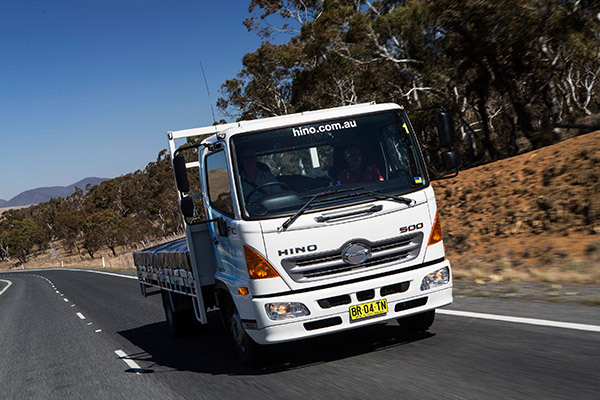 Of course this all remains purely academic, until you get behind the wheel and see how Hino’s medium-duty five cylinder slugger performs out in the hustle and bustle of everyday traffic. Inside the simple, practical interior, the instrumentation was very easy to read at a glance and everything was within close reach for the driver. Still, it all looked as if it would cope with an erupting bottle of coke and still live to fight another day with only a wipe down. Some manufacturers have opted for Allison’s bulletproof torque converter transmission as their auto option, while others have gone down the same self-shifting AMT path that Hino is now setting off down. In many ways the Allison can seem like too much gearbox for a medium-duty pick-up and delivery truck. The torque converter auto, while tough, can be heavy and comparatively expensive to both buy and service. Other AMTs I’ve driven seem to want you to feather the throttle while driving to encourage gear changes as the transmission ECU senses the change in load on the driveline. While this does tend to keep the driver engaged in the process, the fact of the matter is that most of us will just jump into a truck of this size and plant the foot, regardless of what gearbox happens to be bolted to the engine. And that’s pretty much exactly what I did. It may be an AMT but it actually behaved more like a torque converter auto. I mean that in a good way — clutch engagement from standstill was smooth enough and, if you kept your right foot nailed to the floor, the transmission just climbed through the gears without a great deal of engine noise or bother. 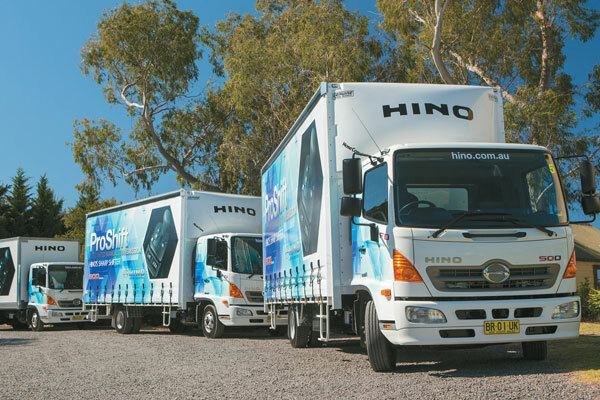 The trucks were also equipped with Hino’s ‘Easy Start’ hill hold function which was the icing on the cake for the AMT in stop-start traffic. The long flat torque curve of the JO7E engine, which develops close to peak torque from 1,200rpm all the way to 2,200rpm but peaking at 1,500rpm, suited this rather proactive approach to driving as the little five cylinder did a mighty job of feeding power to the transmission. My first truck for the day was the 220hp (164kW) FC and it was in this trusty steed I rolled down Mt Ousley towards Wollongong, New South Wales. While I may have been tempted to take the kamikaze approach to hill descent, instead I knocked the gear selector across into manual, held on to fourth gear and let the little FC chug down the hill with the exhaust brake huffing, which it handled easily. I must say I was pleasantly surprised to find a Japanese exhaust brake that actually did anything other than make a funny kind of ‘fuff-fuff-fuff’ noise — it actually helped. The next truck I jumped into was the 240hp (179kW) FD on leaf springs, and with a couple of more ponies underfoot, the package had a whole lot more boogie going on. A casual observer of urban delivery trucks, if indeed such a twisted individual exists, would note that most of these trucks are caned mercilessly. Whether barging in and out of shopping centres, squeezing down CBD side streets or sitting stationary running a power take off unit (PTO) for hours on end, light- and medium-duty trucks tend to cop more than their fair share of use and abuse, and they get no thanks for it. As a largely utilitarian piece of equipment, these vehicles operate in a world devoid of glamour; they just do their job and, at the end of the working day, no one even gives them a backward glance as they walk away. So once out on the Princess Highway heading for the NSW south coast, I have to admit to (legally) driving the FD like I stole it. The AMT, however, almost seems to make the truck unthrashable. With all that torque available so low in the rev range, wringing its neck seems pointless. The transmission, like most AMTs would try and select the highest possible gear at all times, but on the undulating, winding coastal road, keeping the box in manual made it easy to keep the FD’s momentum up. 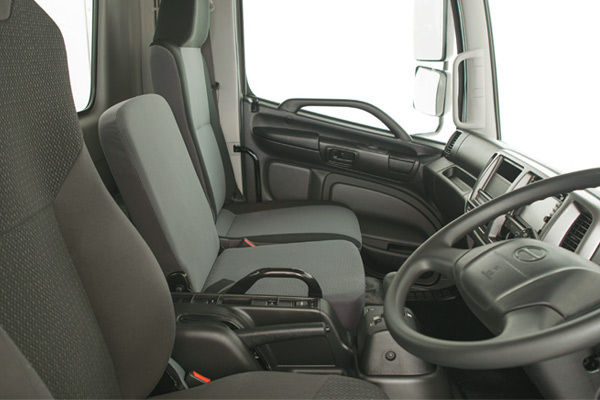 By using a gear stick as a selector, Hino has made manual shifts seem more intuitive rather than using a dial or T-bar, and it seemed to provide the best results rather than simply pushing the power button to hold a gear or lengthen the time between gear changes. Hino also included a 6-speed manual FC 500 on the drive, explaining that it would provide a good comparison to the ProShift box. I disagree with this completely; I think Hino included this vehicle solely for the purpose of providing some entertainment for its accompanying staff, because after spending the previous four hours in a two-pedal AMT, I managed to stall the manual three times before bunny-hopping out of the car park, my face burning with embarrassment. This, of course, dented my professional pride so I can therefore say that I hated it; it was a stupid piece of equipment and I won’t be mentioning it again. The following day I found myself at the wheel of the 240hp FD on airbags, and this was the pick of the AMT bunch, with the best road manners. The 6.4-litre engine provided a surprising amount of punch as we scaled Brown Mountain heading inland towards Canberra. As with the previous day, I found the drivetrain as a whole performed best when driven in manual mode on the tight winding mountain road. With the tacho needle kept at around 2,000rpm, the FD was content to haul itself up the mountain in either third or fourth gear. This of course is not really the kind of environment where this kind of truck is most likely to be found and I’d imagine that in most urban settings the AMT selector would stay in ‘D’ for drive. Later in the day as I made my way back into Sydney, that’s exactly what I did, until we decided the global positioning system (GPS) on the multimedia unit didn’t know what it was talking about and we decided to take a short cut. It was while making a three-point turn after heading in the wrong direction that I found the AMT didn’t like being hurried from forward to reverse and back again. But that could also be put down to me not wanting to hold up the three lanes of traffic impatiently waiting behind me. Once turned around, I could swear that the bloke inside the satnav unit had a smug note to his voice as he told me to "turn left in 1.7km". Overall, the ProShift 6 behind the punchy JO7E engine proved to be a great performing AMT that will be equally at home inching through the daily grind or belting down a freeway. I even think it might be safe to consume fruit while behind the wheel.